Well...it's almost the end of wedding season! 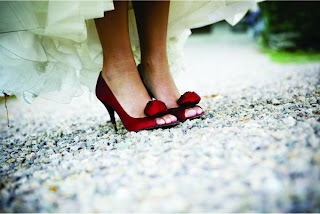 And I couldn't let the season pass me by without a post about BRIDAL SHOES!!! Women often think they are relegated to wearing white shoes...but you don't have to do that! YOu can always shake up that ethereal white wedding dress with a pop of unexpected color on your feet! Whether it matches your color scheme or is your fav color, colored bridal shoes are all the rage! And no...they don't have to be luxe satin or silk either!! One of my fav brands is Pour la Victoire (all available at Zappos.com) ...I LOVE these shoes from them! Aren't these FABULOUS!! So take a walk on the WILD side..and add a little splash of color on your wedding day!! Omg!!!! You posted some CUTE shoes!!! I love that green pump with blue sole. I also love the animal print sandals (last pair of shoes) that the bridesmaids are wearing. And the pink with black lace shoes are fab too! Its funny because i tried on the Cristella 2 in Hot Pink because i saw them at a thrift store for $20. Yes, brand new!! Sadly, they only had a size 7, so i was squeeeezing. But it didnt work out. lol. I think ran home and looked it up online. And even though i loved them (that bow detail is so cute) i couldnt bring myself to spend that amount, esp after seeing it for $20. *sigh* I heart them though. These shoes are hott. I want a wedding gown just so I can get those Giadas. I love non-traditional shoes at a wedding. They add some OOMPH.